Nowadays if my Mother posted this on Pinterest she’d probably get arrested, or at the very least, an online smackdown. I have to admit, the one time having a child ever entered into my vodka-soaked brain, it was because of the appeal of dressing it up, so I have no problems whatsoever with this but then again, I have never been known as a Beacon of Appropriateness. 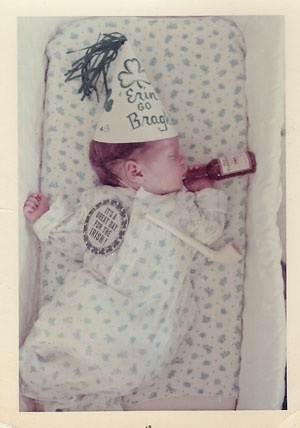 My other favorite thing about this picture (besides the airplane whiskey) is that my Mother had GIVEN BIRTH forty days prior to this picture being taken and she and my Dad were not going to let a thing like the arrival of a fresh new leprechaun jack up their party schedule. IT WAS THE SIXTIES, people. My Mother probably didn’t even remove her dangling cigarette from her lips as she was positioning my wee pipe. One could say that I never had a chance by looking at this, one of the very first pictures ever taken of me. Can you be destined to be an alcoholic? I don’t know, but the one thing I do know is that the one thing I DID inherit from my parents was a exemplary sense of humor and that’s gotten me through everything so far which also begs the question why my Mother is NOT GOING TO FIND MY POSTING THIS FUNNY AT ALL. I love you, Mom. Happy St. Patrick’s Day, everyone!